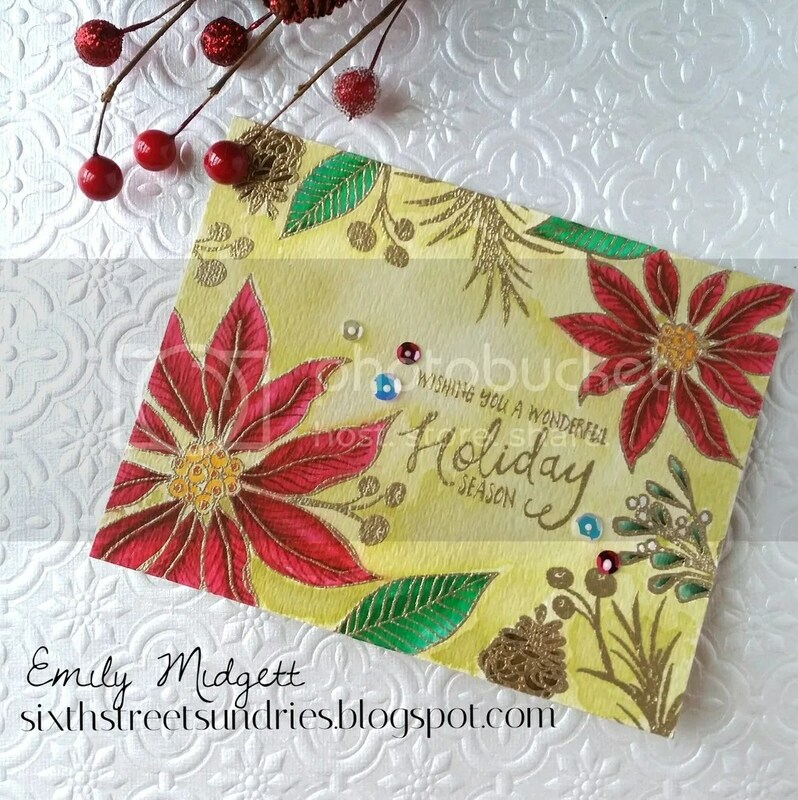 For the majority of this card, I used Distress Inks that I tapped onto a clear block for my watercolors. I wanted the colors to be a bit more muted than my Zig markers allow, so I tapped the ink pads onto the clear block, then diluted the color with water. The color is still very vibrant, but not quite a vibrant as if I had colored directly on the paper. (I might be wrong, but that’s my story and I’m sticking to it!) After the initial color had dried, I went back in and added some shading, first with Distress Inks to the center of the poinsettia petals, then with my Zig markers to add some veins. Distress markers are fantastic, but you can’t beat the tiny little brush tip on the Zig markers when it comes to detail work like this. I went in with the Distress color Old Paper that had been diluted down to add the color to the background, going back in and adding color to some spots occasionally to create that fun mottled watercolor look. After I was finished watercoloring, I allowed it to dry, during which time the panel curled up. I usually try to tape my full-panel watercolor projects down to a flat surface to avoid this happening, but I didn’t want the line around the edge. My solution was to put it under the seventh Harry Potter book overnight. (Isn’t that what everybody uses Harry Potter books for?) 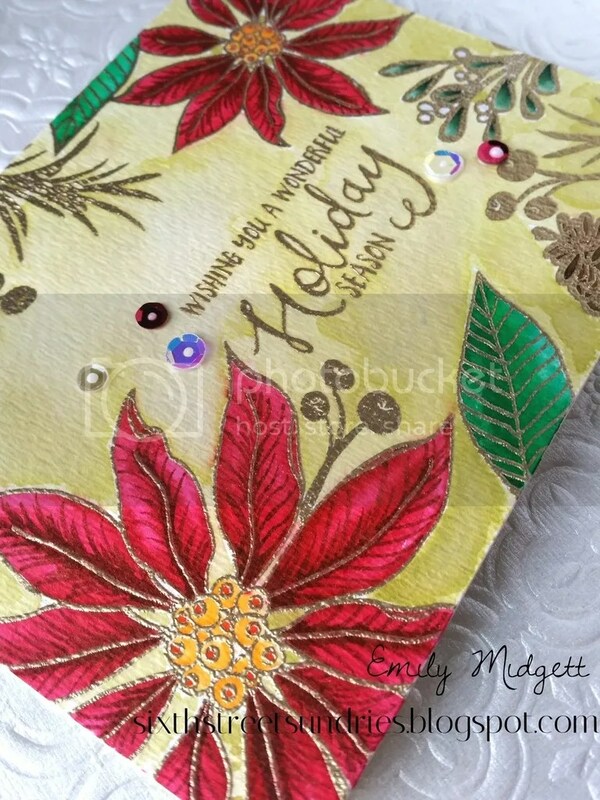 In the morning, I adhered it to a Spring Moss (from PTI) card base and added a few sequins. They were from the Winnie and Walter birthday mix that I received in an order from earlier this year. I have yet to find a suitable truly iridescent sequins, so I’ve been hoarding these, but they added just the perfect amount of sparkle to this card. I hope you enjoyed this! Have a fabulous weekend, friends! lovely Emily! Your card is inspiring! TFS!